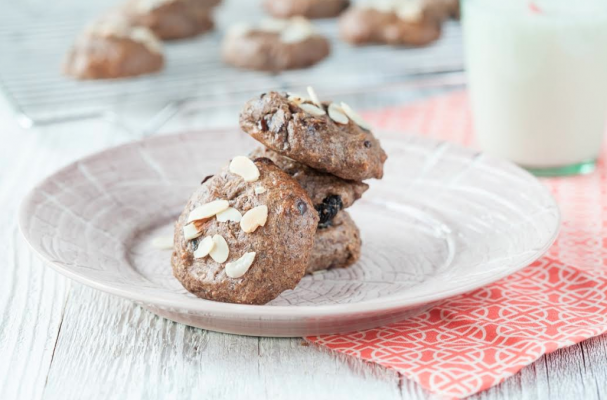 Chocolate almond cherry power cookies from Against the Grain fuel the body so that whether you need something quick for breakfast or an afternoon pick me up, these cookies are guaranteed to satisfy. This slightly sweet treat is gluten-free, dairy-free and egg-free and vegan so they can be served to almost anyone with dietary restrictions. If cherries do not happen to be your thing, feel free to substitute with unsweetened dried cranberries. Step 1: Preheat the oven to 350°F and line two baking sheets with parchment paper. Step 2: Whisk together 1/2 cup hot water and ground chia seeds and let sit at room temperature for 15 minutes to thicken. Step 3: Meanwhile, in the bowl of a stand mixer, combine the almond butter, flaxseed, arrowroot, applesauce, maple syrup, cinnamon, lemon juice, nutmeg, ginger and sea salt. Mix on medium speed to combine fully. Step 4: Add the thickened chia mixture to the bowl with the baking soda and beat again until fully combined. Stir in the cherries and chocolate pieces. Step 5: Using a cookie scoop or a large spoon, drop dough onto the lined baking sheets. Wet fingers slightly with warm water and gently press the mounds down to flatten slightly. Sprinkle the tops of the cookies with sliced almonds. Step 6: Bake for 15 minutes, until golden brown around the edges and the almonds are lightly toasted. Cool on a wire rack completely before serving.